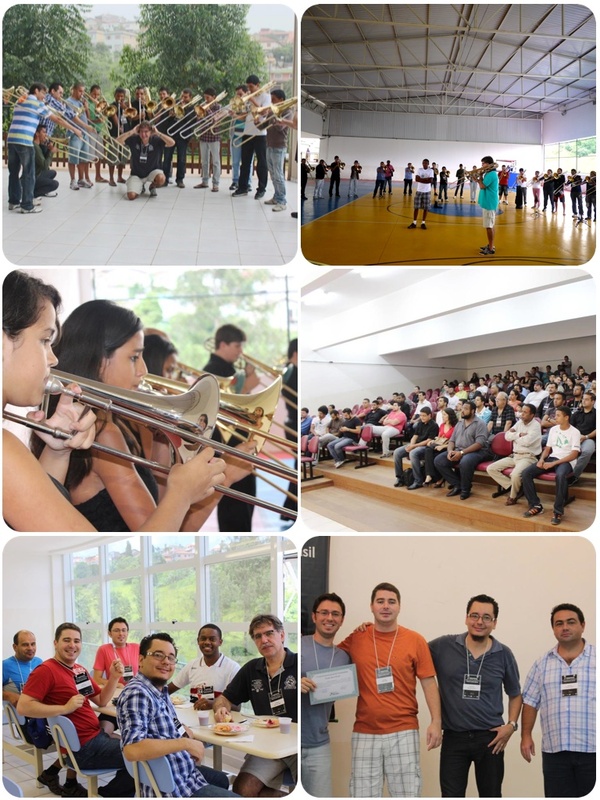 In the third week of 2013 I participated as guest soloist and teacher at the first trombone festival organized by the "Projeto Bone Brasil" trombone ensemble. 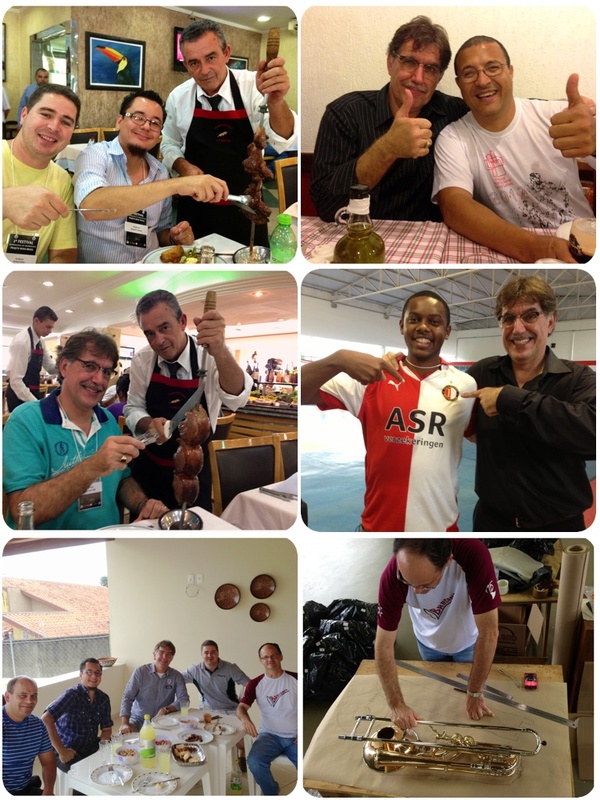 The other teachers during the festival were: Martin Herrera, Carlos Freitas and Ricardo Santos. 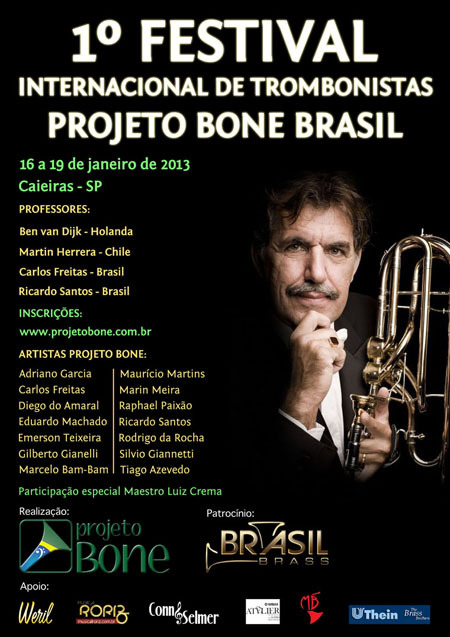 This ensemble consists of professional trombonist from around Sao Paolo and the artistic leadership is in the hands of my friends Carlos Freitas and Ricardo Santos. Both Carlos and Ricardo I already met during several other festivals and they became good friends. It was an honour to be their principal guest during their first festival of the ensemble. The festival was organized in a little town close to Sao Paolo named Caieiras. The found a complete new school building, not yet used, available for the festival. This proved to be a perfect location with many rooms and even concert facilities for hand. 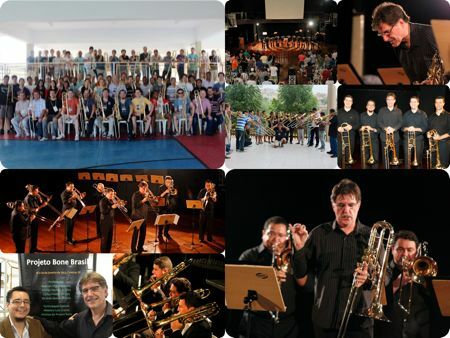 Some 80 trombonists gathered together on day 1 of the event, an amount that is very impressive when you organize a festival for the first time. Most participants Brazilian but some came from Chile, Argentina, Peru and even Germany. The level varied from beginning trombonist to professionals but in my opinion the average level was very high. I had some young very talented players in my master classes that played on the highest international level. The festival started every morning with a mass warm up in the Gym of the school. An impressive hour when you are standing in the middle of a circle of 80 trombonists who repeat what ever you have played for them. I performed 2 of these sessions and will not forget this sound coming from all directions. The discipline during the festival was of a very high level and during these warm up sessions you really need this to make it successful. During the day there were master classes by all teachers and many other activities to entertain the participants. Every evening there was a concert scheduled and on the opening evening the organizing ensemble had their big concert. An amazing program in different set ups with traditional but also new repertoire for trombone ensemble performed on the highest level. Day 2 had concert by, what they call the Projeto Bone Pop ensemble with a jazzy-latin concert for 6 trombones and percussion. Wow, what a drive and inspiring concert this was. I enjoyed every minute of it. Day 3 was my concert and for this I asked the ensemble to join me. Day 4 was the last mass concert. Original planned outdoor but because of rain indoor! On my last in Brasil I visited Marcus Bona. The idea was to design a new case for my basstrombone. The smallest ever. Marcus did great work and 6 weeks later I received the first model of this new case. We had a great time at the Bona house and joined a wonderful BBQ. Thanks so much for inviting me and I hope to be part of this event again in the future!